Flying Emirates or Singapore Airlines is a pleasure; flying Aerosvit is somehow an adventure which can turn into an excitement. A first experience with what still remains quite a confidential airlines, sounds like a gift for the experienced traveller. After all the spooky, often very outdated literature which we have read about this Ukrainian carrier over the Internet forums, and also due to the low rates in business class, we couldn't wait more before see with our own eyes what it actually looked like. For those who don't know Aerosvit, which means most of yours, this airlines, established 1994, is the youngest carrier in Europe. Fast growing, it took in 2000 the first place among Ukrainian companies by the number of passengers. A member of IATA, it services over 72 destinations, directly or by code-sharing: including lots of CEI – Central and Eastern European routes, plus services to China, Vietnam, India, Canada, USA, Sri Lanka and Thailand. The company also performs flights to various administrative centers in Ukraine (Dnipropetrovs'k, Kharkiv, Donets'k, Odessa, L'viv and Simferopol). All Aerosvit destinations are departing / transiting from KBP - Boryspil International Airport, Kiev. Knowing that this is a Skytrax two stars airlines, which passed the IATA Operational Safety Audit (IOSA) benchmark for global safety management showing excellent security records, we were not expecting much more than a convenient, low cost business class flight offering the best value for money C class tickets over the Internet. Our first good surprise was the booking and confirmation process; VV homepage comes so easy to use. It features an integrated on-line chat, which we experienced for some questions concerning our flight: within a couple of minutes, the operator reacted with a prompt, precise and very kind response. This was our first experience with chat over an airlines homepage: we liked it very much. Another very positive aspect was the time-saving schedule allowing us to take off from BKK- Bangkok Suvarnabhumi International Airport very early in the morning (5 am): avoiding the terrific traffic jam (it took us 20 minutes to cover the 30 kilometres between our hotel and the airport...); arriving in KBP - Kiev Boryspil in the morning (11:25 am) for a very short transit (little bit more than 1 hour), and reaching our final destination (PRG - Prague Ruzyne Airport, Czech republic) right after lunch time (14:40 pm). Considering that there is no direct route between Bangkok and Prague, VV proposes 3 times per week the shortest flight compared with all the competitors. Business Flex and Business Super Flex passengers are promptly checked in at a priority desk. While the economy class queue was quite impressive (Aerosvit offers low cost Y class tickets which are aggressively cheap and sells out like hot cakes), we checked our luggage and got our boarding pass and Business Class Lounge invitation in hand within less than five minutes. All business class passengers can use the Bangkok Airport “Fast Track” immigration police control section... if it is open. 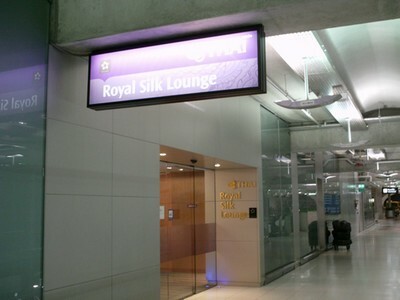 At 3:40am, it was closed, and we had to cope with a 25 minutes queue before we could do some shopping and rest in the pleasant “Thai Airways Royal Silk Lounge”. At that early time of the day, it caters only VV 172 passengers; in case of any delay, they are informed immediately. Which was not our case, as we boarded and departed right on time. Aerosvit gained from the past quite a bad reputation for delayed or cancelled flights; one month before departure, we checked departure and arrival day by day on the Bangkok-Kiev, and also on the New York-Kiev routes, and everything was in perfect order. Things goes better since VV purchased more -and new- planes in 2011-2012 (14 Boeing 737-800 Next Generation aircraft are currently delivered, and more B767 are leased), and can therefore swift another aircraft when last minute maintenance looks necessary. Our Boeing B767-300 ER (VV operates eight of them) featured an old C class cabin configuration, accommodating 24 passengers. 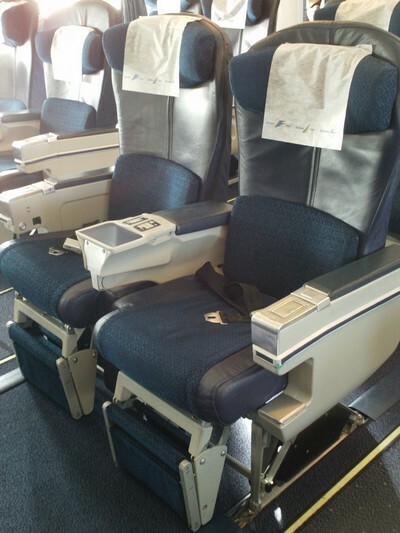 We would compare it with the 4 rows 2-2-2 staggered seat configuration aboard major US airlines, domestic flights. Still very comfortable, the ergonomically designed seats with adjustable headrests and legrests, convenient width, 130° recline and 48 inches legroom pitch, were more than OK to enjoy a long haul flight at ease. We found it easy to get in and out our window seat, and scoot pass the passenger sitting next to us on the aisle. The cabin crew kindly presented us one glass of orange juice (“Champagne” -which is actually a decent Ukrainian sparkling wine- came later, right after taking off) and a fresh towel. That was our first contact with the dreaded staff depicted in some airlines related forums over the Internet; we don't know how it looks in “chicken class”, but in Business we received a great treatment, always with a smile and much anticipation, during the whole flight. The C class cabin was full from Bangkok to Kiev; we were the unique passengers from Kiev to Bangkok. The service was the same. Quick, efficient and friendly. The crew's ability in English is globally good, and the contact is easy. Last but not least, the Ukrainian stewardesses are kind and nice looking: which is enough to make the male passenger accept, without claiming high and loudly, the lack of toiletry kits, blankets and pillows. Though the ambient temperature was ideal, a blanket would have provided that little extra pamper any executive class passenger is normally expecting. Note that we faced the same problem both ways: so that was not an exception. Though we are feeling sure that Aerosvit will correct this small detail, we would advise the now informed passengers to bring a pullover, some earbuds and one eye mask in their cabin bag. The stewardess approached us about 30 minutes after taking off, inquiring whether we wished to have our breakfast now or later, and at what time we would like to be wake up and have our lunch. Food, provided by Kyiv-Catering and Aero-Catering Services Ukraine, is conveniently rich and good. 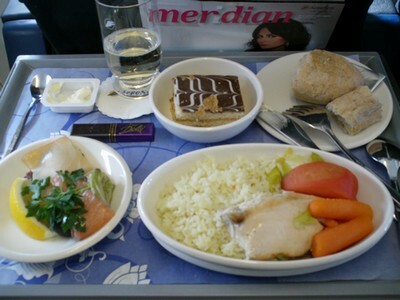 It doesn't look nor taste like airlines meals: it comes with a touch of “terroir”, with lots of local products and specialities. Wine, vodka and cognac are Ukrainian. Though the stewardess told us that the catering had been embarked from Bangkok, the Salad with Mozzarella and Black Olives was as delicious as the one, fresh from the market, that we got our way back from Kiev. The Turkey Medallion with Mushrooms and Sautéed Potatoes was certainly not a Thai speciality... We found it excellent. The Sponge Cake with Apricot, Almonds and small crystallized Sherries which concluded our breakfast was as yummy as in Viennese coffee shop. Even the small chocolate tablet, made in Ukraine, which we received with our coffee, was quite good. Lunch was as solid as breakfast: Smoked Fish with Dill, Olives and Quail Eggs, then a typical “Kiev Beef” with really authentic mashed potatoes (yummy! Only our mother does it better), and a great Apple Pie with a Red Fruits Coulis which was the antithesis of the artificial, tasteless pastries we sadly always experience in the sky. Of course, we have been served in lovely china dishes, fine glasses and with elegant cutlery. A better selection of wine would have been a bonus: French, Italian and New World wineries should be represented on a business class list of beverages. Though we were quite satisfied with our Ukrainian red wine, tasting like the Hungarian Egri Bikaver (Bull Blood): strong, powerful and finally rather epicurean. The entertainment aboard is quite poor. We won't claim, as we fly business or first class just to sleep well and avoid the jet-lag. But those looking for blockbuster movies, games or the latest hits might be surprised to have nothing else proposed but outdated movies alternating with geo-localization maps over small and old screens. On the Kiev to Bangkok route, we received an Archos tablet with some American and Ukrainian (Russian?) movies. Which was a good initiative; but we didn't got it from Bangkok to Kiev. Maybe because the cabin was full, and they didn't get enough units? The music was OK for us: we like classic, and the earphones where good quality. We inclined our seat, extend our legrest, and slept like babies. During the day flight from Bangkok to Kiev, and the night flight from Kiev to Bangkok, we called the stewardess once or twice for water and fruit juice. She came on the spot. Before landing, right after lunch, she suggested more coffee, juice and chocolates. Kiev Boryspil (KBP), once a dreaded airport, improved very much. We transited -business class passengers first... but everybody squeezed onto the same bus like sardines in a can- to a modern, conveniently comfortable airport; we would suggest VV to allow its executive class and Meridian Card passengers a fast track: the queue in the transit area can be impressive some days. There was no way to avoid it. The transit desk at Terminal B can be very busy also, with extremely limited staff: three dull, stressed ladies were in duty, trying to provide information to passengers from the former Soviet republics, who sometimes didn't get a visa, or simply didn't speak any civilized language... We suggest business class passengers to be audacious, cross the line and politely though firmly ask the invitation necessary to access the Business Class Lounge. A very nice one, indeed. We have been impressed by the cleanness of this huge, well lit room, which we found so comfy and positively “old style”. It made us feeling like travelling throw the ages, visiting a 1970's first class lounge, with its large sofas, private bar with barman and barmaid in white uniform... and live piano atmosphere: we travelled so much, and everywhere; thus, this is the very first time that we saw a grand concert piano in an airport lounge. Those details make a trip particularly enjoyable and unforgettable. Our transit was a short one; it just gave us the pleasure to listen to easy music, surfing the Internet (WiFi is complimentary), a glass of Hennesy Cognac in hand: the bar is well provisioned, with top quality liquors, a good and strong espresso coffee, and delicious sandwiches. We were not expecting so much from that lounge. A very good mark to VV and to KBP airport. Note that, when we publish this in-flight test, in June 2012, KBP new Terminal D is just starting its operation. Part of the ambitious airport expansion, its opening coincides with the 2012 UEFA European Football Championship, which takes place in Ukraine. Completed at a cost of USD 208 million, the Terminal D has a capacity of 1,500 passengers per hour, and covers an area of 44.9 hectares. Queues will surely disappear, and all passengers will leave KBP like us: with a good impression. Our final destination was Prague. This is, with BUD - Budapest and WAW - Warsaw, a much wanted touristic and business destination. Aerosvit operates 8 weekly flights WAW-KBP (in addition it has code-shared flights with LOT), 9 PRG-KBP and 11 BUD-KBP . The transfer to the aircraft was done by bus: again, without any priority for business class passengers. A good tip: if you don't want to freeze in Winter time, or melt in Summer, wait for the last call and be the last passenger to join the shuttle. Unless, in the meantime, VV had opportunely decided to set a VIP transfer to its preferred passengers. Once in the Dniproavia B737-300 (operated by VV, with VV crew), we took up with prime comfort and great service again. We were a couple of passengers, and the steward catered us with Champagne (this was, again, a “sekt” made in Ukraine; still well chilled and palatable) and a generous lunch from Aerosvit catering company. That was much more -and far better- than what Air France or KLM, just to drop a few world famous airlines, proposes to its business class passengers. Concretely, and shortly, we would conclude positively. Aerosvit makes it quite well, and will surely make it better in a near future. Shouldn't it be for some small negative remarks (no blanket, no pillow, no toiletry kit, no priority onboarding and outboarding with separate shuttle transfer, and a limited entertainment aboard), this is a good and definitely safe airlines. Complaining about the still plain Jane aspect of VV would sound a spoiled traveller's tantrum: the rates are so competitive. Flying from Europe or the USA to Asia for more or less USD 2000 comes like a bonus to those who don't only want to be transferred from one point of the planet to another, but are also seeking for the pleasure of flying. We were looking for a travel experience; VV fulfilled the contract, and left us with the good impression that we will fly with them again. Important update: Aerosvit started bankruptcy proceedings in December 2012. By the end of 2013 most of its routes (including Bangkok -from mid-December- and eventually New York) should be operated by UIA - Ukraine International Airlines, with new aircrafts and a totally refurbished business class cabin on long-haul.